I grew up reading books, and became interested in making stories myself. I worked out scenes and bits of dialogue, and made my friends act out little dramas based on my favourite book at the time – Rudyard Kipling’s Jungle Book. With that background, it was inevitable I would become a writer. It just took a while. After establishing a career as a librarian – first at the University of Saskatchewan and then at the Greater Victoria Public Library in British Columbia – I had a meaningful encounter with H.P. Lovecraft’s character Herbert West. Strangely fascinated by HPL’s corpse-reanimating physician and his friend the nameless narrator, I built a set of stories around them. In 2000, I was compelled to write them down. The result was The Friendship of Mortals and three more novels, which constitute the Herbert West Series. Self-publishing became respectable and relatively easy just in time to rescue me from the sad fate of the Unpublished Writer. Reluctant to abandon the characters I had spent so much time with, I wrote and published several short stories as supplements to the Herbert West Series. 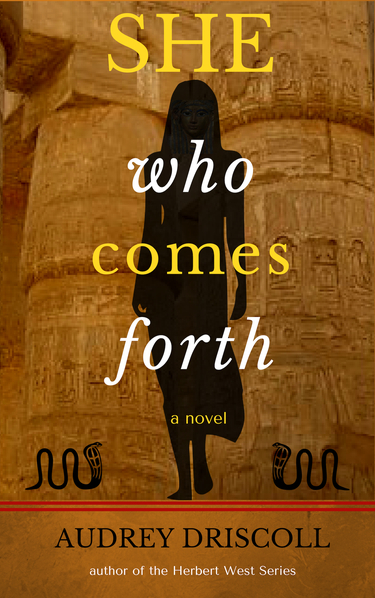 I have recently published She Who Comes Forth, a novel that may be considered a sequel to the series. My other interest is gardening a patch of earth on southern Vancouver Island. I post about that at least as often as I do about books and writing — with pictures! To me, writing and gardening are forms of alchemy — a mysterious process of creating excellence from the chaos of the world. I welcome comments on any of my posts, current or older. I always respond to comments, and almost always visit blogs of those who leave “likes.” I follow more than 100 blogs, so no longer routinely “follow-back.” A bit more about my blogging style can be found in this post. You may find me on Goodreads, Amazon, and other sites where ebooks are sold, or contact me by email: Audrey.d@telus.net. I have to say I am completely charmed by your take on the Re-animator story. It’s so true to the original in so many ways while also being unique in a manner. A belated thanks for your comment. I’m new to blogging so it has taken me a while to get around to replying to comments. Since I began writing my version of Herbert West’s story, there have been moments when I thought it was a peculiar thing to do. For a lot of people, Herbert is just a weirdo mad scientist, so I’m happy that there are a few who can relate to a more subtle interpretation. I’ve only just seen your wonderful review of my mystery, A Hemorrhaging of Souls, on Smashwords. My apologies for not touching base earlier to thank you for your kind words and reviewing effort. I’m very grateful. I’m delighted to learn you’re a fellow Islander and gardener. Very cool. Good luck with your writing and dirt digging. I’m holding my breath on a bunch of blue poppies, waiting to see if they survive the winter. Will post pics on my blog. Cheers! Hi Nicola. I found out about Smashwords and WordPress from the great talk you gave last March to the Victoria Writers’ Society. Blue poppies — most seductive for the gardener. I have a bunch in pots that I’ve grown from seed. Great topic for a blog posting, I think. I’m looking forward to seeing your pictures. Hello, Audrey. I am Charles Milburn. Yes, the real one. That’s my real name. I live in St. Louis and my sister’s name is Audrey. I write short stories and plays. I’m an actor and have been in movies, on TV and many times on local stages. You owe me money for using my name. Just kidding. I do wonder where you got the inspiration to use my name, though. What a pleasant surprise! I knew there was at least one real person named Herbert West, a onetime candidate for governor of Kansas, but it’s interesting to hear from a real Charles Milburn. And I myself have a fictional namesake — a character in Danielle Steel’s novel Wanderlust. How did I come up with the name Charles Milburn? Well, Charles seemed like a good, solid name for a guy from an old-money Boston family in decline. And I co-opted Milburn from Peter Straub’s novel Ghost Story, which is set in a fictitious town of that name. Since my novel is based on H.P. Lovecraft’s story “Herbert West, Reanimator,” it seemed right to give the narrator (who is nameless in the HPL story) a name from a horror novel, even though my novel isn’t horror, not exactly. Thanks for your comment; it made my day! In September I begin studies as a Master Gardner. I might flunk out, though, if I can’t remember all the Latin names I’ll be expected to learn. Nice to connect with a fellow writer and gardener. I’ve thought about taking a Master Gardener course, but haven’t made the time as yet. Another thing to do when I retire! At least I have a pretty good memory for Latin plant names (so far). Nice! I enjoy visiting your blog! 🙂 I see you also have autumn crocus in your garden, have you seen they grow seeds in the past? I haven’t noticed seeds, but the plants have increased quite a bit. So maybe they do seed, or possibly produce small bulbs that grow into new plants. Hi, Audrey. Thanks for following my blog! I look forward to exploring yours as well. Yes, I remember meeting you on that quite exhilarating evening. Thank you for following my blog and I hope you enjoy reading me. I was wondering if you would be interested in reading a free copy of my romance ‘Reunion of the Heart’ in exchange for a fair and honest review? Your blog was recommended to me by Chris (The Story Reading Ape). Thanks for following my blog. I will respond via the email address you left. I’ll certainly consider reviewing your book. Please send me a brief description of it to the following address: Audrey.d[at]telus.net (substitute the @ character for the [at], of course!). Do you have a contact page or email? I would love to see if you might be interested in reviewing my 2nd book, recently released? That’s OK, Fiona. Four more books — impressive! You’ve been nominated for a Liebster Award. it’s a Pay it Forward kind of thing. All you have to do is nominate ten blogs with fewer than 200 followers, compose ten questions to ask them, and link back to my blog. 1. If you could live as a fictional character, who would you be? 2. What is your first memory of a book? 3. You’re the Reading Rugrat at your local library, what would be your first choice of book to read to the children? 4. You’ve just started a Book Club, what top three books are on your must-read list? 5. If you could live in another world of your choosing, what world from what book would transport you? 6. Out of all the books you’ve read, which one do you feel changed your perspective on life? 7. If you could rewrite a book to make it better, which one would that be? 8. You’re having dinner with your favourite writer, what is the first question you’d ask? 9. After you’re finished gushing over your favourite writer, what is the second question you’d ask? 10. What book haunts you? Thanks for thinking my blog award-worthy, but as it turns out, I have found my efforts to participate in the awards process to be somewhat lame, so I must decline, with thanks. Thanks for the comment — and the follow! Would you have any objection Dodo Books posting your splendid and helpful review for Short Stories : Crimes, Cults and Curious Cats by Jonathan Day on Amazon? I have no objection. Glad you found the review helpful. (I acquired my copy from Smashwords). Your reviews are certainly more perceptive and professional than many found online. I’d be happy to host, but be aware this will be a first for me. (I’m one of those low-powered bloggers). Email me at: Audrey[dot]d[at]telus[dot]net to work out the details. Hi, Audrey! Delighted to meet you! It came as a lovely surprise to find that someone had reviewed my book, Deception Bay. Thank you for reviewing it…and am glad you enjoyed it. Hi there, Audrey. Thank you for liking the post I shared yesterday from Rebecca Bryn. I too have a small ‘patch of earth’ and love gardening and the opportunity it presents to my characters to tell me their thoughts. Yes, some good writing ideas come my way while raking leaves or grubbing about in the perennial beds. The trick is to remember them. Thanks for your comment, Frank. Thanks so much for the new ‘likes’, Audrey. I wish yo all the best with your writing and gardening through 2018 and beyond. You’re welcome, Frank. And thanks for the good wishes. I need advice. I am writing a book about my daughter. I started it in Word years ago. Then I started hand-writing it so I could move parts around. Now, I am releasing parts of it on my OTHER blog, seizuremama.wordpress.com. As you can tell it’s all over the place. I have it all in one notebook, but I am overwhelmed on how to put it all together. Do you use an app? I read about Scrivener. What do you use. HELP!!!! Hi Flower. The only writing aid I use (apart from pen and paper) is Word. I know writers who swear by Scrivener, but have never tried it myself, so I don’t know how easy it is to learn. If you’re comfortable with Word, you could certainly continue to use it. Maybe create a separate Word document for each section, and eventually copy each one into a new, combined document. It’s pretty easy to move text around in Word by highlighting, copying, cutting and pasting. It’s best to keep things like fonts, line spacing, indents, etc. the same throughout. I published four novels in ebook and print form, doing all my own formatting. Each one started as a Word document. So it is doable. Feel free to ask about specifics, and good luck. Thank you for your help. It all seems fragmented and scattered. I will try to regroup. My garden will start keeping me busy soon. I was hoping for more progress. I am not a writer. I’ve been out in my garden the last week too. It gets priority over writing in spring and summer. I started my reading with Tarzan books “hundred” years ago. 🙂 In my family we read yet today every evening before going to sleep. Reading is one of the best things in life. Hi Audrey! I found your blog through Berthold Gambrel’s Thanksgiving share. I’m looking forward to seeing your posts in my Reader. Happy Thanksgiving! I hope you enjoy the posts. Happy Thanksgiving to you too! Audrey, thank you for visiting my site and “liking” one of my environmental posts. I do research like that because I’m a professional grandfather, and want a life for all the young people on the planet, and a life worth living. In one of your posts, you are contrasting writing in the dungeons, isolated and concentrating. vs. in more normal and distracting circumstances. My guess is that it makes no difference, because the REAL writing is done by your subconscious and, if you’re anything like me, pecking at a keyboard or pushing a pen around is merely recording. It’s the imagining that I find hardest. Or, to be accurate, turning the sometimes hazy mind-movies and intentions into written words. Audrey, it’s lovely to meet you! You have an amazing smile. Great photo. I appreciate your enthusiasm for writing, and for gardening. So glad you came to visit my blog. Thank you, Matilde! I’m happy to hear that. Wishing you a nice weekend too! Hi Audrey. I read your posts on the Whitechapel Whelk site – which cheered me up considerably! I decided to self-publish after querying a handful of agents and deciding I couldn’t be bothered to put myself through that! I don’t expect or need to make a living out of writing. I want to write stories, and it’s great to have my books on my bookshelf and to be able to put them out there. I’m dreaming the impossible dream! Love your site and your attitude. Thank you Tim (aka “Anonymous”). Self-publishing has opened up creative avenues for many. We can be as “professional” as we want to be, but we do have to manage our expectations when it comes to sales and reviews. Thanks for your interest! Anonymous at 2.57 pm was me – didn’t mean to go covert – just not very good at this yet!